This monogrammed slate cheese board makes a sophisticated gift all by itself, but we take it to the next level with an offering of premium artisan cheeses and gourmet pairings. Slate Cheese Board with Rope Handles. Tuscan Herb Salami, Natural Crispbread, Stone Ground Mustard. Sartori Asiago, Bellavitano Black Pepper Wedge, Beemster Vlaskaas Cheese. Each gourmet item is carefully assembled to safeguard the shipping process. A free card is included with your personal message, as well as complimentary scissors so your recipient can easily open their gift. 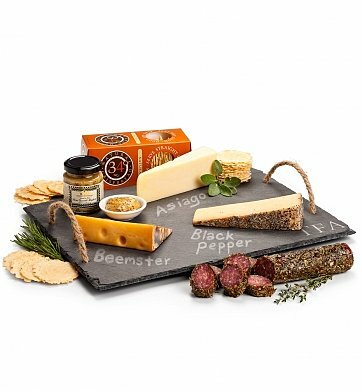 Your gift will leave a lasting impression as they continue to use and enjoy this 1/4" thick solid stone cheese slate with rope handles, velvet backing to protect delicate surfaces and natural edges. Free Engraving! Your selection of three initials or a monogram engraved on the slate surface. Enter information to be engraved using the personalization option during checkout. Measures 15.5" x 11.75" x 0.25". Award-winning Sartori Asiago, with six months of careful aging, and hand-rubbed to perfection. Sartori is the recipient of Wisconsin State Fair's Silver Medal in 2010 and 2008, and the 2010 World Cheese Awards Bronze Metal. Personalized Slate with Artisan Cheeses is a hand delivered gift. These gifts are delivered by one of our local design centers located throughout the United States and Canada. Same day delivery is available for most gifts when ordered before the cutoff time. The cutoff time for Personalized Slate with Artisan Cheeses is in the recipient's time zone. Three artisan cheeses: Asiago, Dutch Beemster, Bellavitano Black Pepper. Natural slate cheese board with complimentary personalization. Slate just great and cheeses are delicious! All of a great quality. I would recommend this platter. The salami and cheese was greatly apricated. As was the cheese board. Both in presentation and quality of food, this was loved by everyone we gave it to this year. I gave them to all the managers in my company and they loved them! The cheese was excellent and the personalized monogramming added a special touch. For the third year in a row I have used GiftTree for gifts to special people. In particular I have sent the artisan cheeses with cheese plate the past two years. Very much appreciated. Thank you all. Had it shipped to friends that I was visiting. They seemed very pleased with the gift. The gentleman I spoke with on the phone was very helpful and friendly. Will use your service again. Thanks so much! My mom considers herself a cheese board connoisseur, so she absolutely loved this spread AND the fact that we had it engraved with her initials. She will keep the board forever but still savor the moment. Gave this to my son & his wife for Xmas. They used it this past Saturday. They really like the slate cheese board as it keeps the cheese cool. I saw this and wanted to get it as a gift for my daughter's 30th birthday. I thought she would like it as she does a lot of entertaining with her friends. I was right! She loved it and couldn't wait to call me as soon as she received it! I was a bit concerned since I could not see it in person before ordering it, but I asked her many questions about it when she called to tell me that she loved it. Every answer she gave me was positive! I would definitely recommend this gift to others! My mom loved this Mother's Day gift. She thought the Cheese slate was "really cool" and it will be fun to write on it at parties with her friends. She is enjoying the cheeses as well. I was looking for something to send my parents who are gluten free and have restricted dietary needs. They LOVED it! They really liked that the slate could be used for entertaining. Thanks! We are a general contractor and send 'Welcome Home' gifts to clients when we finish their new home construction or major remodel. We selected this gift to meet the personality of our client and they were pleasantly pleased, as the wife had been looking for something similar. The sleek modern look went very well with their selected marble counter tops. I would recommend this gift to anyone looking to send something slightly personal but versatile. I did not receive this but bought and sent as a gift. The reciepient though said it was very nicely packaged and beautiful. Of the items tried so far, they were delicious. I may have given more stars had i known at this point if they tried all and how they tasted. The stone was great as well.